First released in 2003, Disney•Pixar's "Finding Nemo" takes audiences into a whole new world in this undersea adventure about family, courage and challenges. When Marlin, an overly cautious clownfish living in the Great Barrier Reef, helplessly watches his son get scooped up by a diver, he must put aside his fears of the ocean and leave the safety of his coral enclave to find Nemo. Buoyed by the companionship of Dory, a forgetful but relentlessly optimistic fish, Marlin finds himself the unlikely hero in a seemingly impossible land-and-sea rescue. 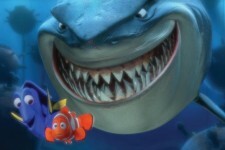 "Finding Nemo" won an Academy Award® for Best Animated Feature and was nominated for three others. With a total of $867.6 million worldwide, it was the second highest-grossing film of 2003.